The Japan-America Society of Pennsylvania (JASP) is a 501 (c)3 association of individuals, corporations, and organizations in the state of Pennsylvania and its surrounding regions that was established in 1986. Its purpose is to promote understanding and enlightened relations between the United States and Japan. The Society provides informative and innovative programming in order to encourage a better understanding of the business, cultural, social, educational, and political practices and customs of Japan and the United States. 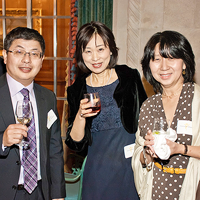 JASP members gain access to business, educational, cultural, and social programs focusing on U.S.- Japan relations, which also provide opportunities for developing personal relationships with members of both the Japanese and American communities. Membership is extended to individuals, non-profit organizations, and corporations. Please see the Membership page for more information and to join. The Japan-America Society of Pennsylvania is part of a global network that seeks to promote good will in the growing and evolving relationship between the peoples of the United States and Japan through local business, cultural, and educational outreach. The JASP logo, a calligraphic representation of Pittsburgh's three rivers with the city's skyline at its confluence, has been a convenient visual representation of our core mission: To serve as the go-to information source for and liaison between the Japanese and American business, cultural, and educational communities in the Western PA and tri-state area.